We offer two separate ranges and systems for packaging all types of food that can then be deep frozen and reheated in either the oven or microwave. 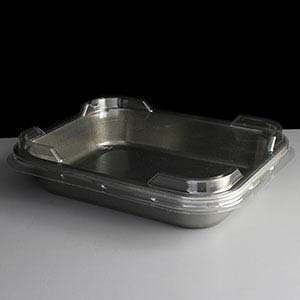 Both systems, airPET and CPET include a range of dual ovenable trays and film in various sizes along with lidding machines to seal them together. You will need all of the following components: A Machine, Dual Ovenable Trays, Lidding Film and the correct Metal Form. All 4 parts are required for the machine to work. Please see the table below to easily see the differences between the two ranges of microwave and oven safe trays above. Do you need a printed sleeve to go around our CPET Dual Ovenable Trays? We are able to supply bespoke printed sleeves for our CPET trays listed above in batches of as little as 1000. For a quote please contact our sales team with your specific details and we will get a price put together for you.